It seems as though every year dozens of films that celebrate the American spirit are released-- usually in the form of underdog sports movies-- wherein the outsider, the poorer kids, the unlikely team or the least experienced player defeats the favored competitor in spectacular glory. And while these usually result in some truly mesmerizing movies such as Rudy, The Greatest Game Ever Played, Miracle, Glory Road and Remember the Titans-- just like in high school where the jocks ruled the halls and sports funding is always renewed at the expense of the arts-- the one thing that's never fully celebrated is just how much the arts and especially music can be a similarly fascinating field. For whether you're on the stage or in the choir, if you take it seriously-- just like throwing or catching a ball-- working hard can in fact pay off... even if it's only temporary. When musical biopics hit the silver screen-- it's always the drugs, the scandals, the groupie lifestyle and the drama that takes center stage more than anything else. And although the tales of musicians and especially jazz and blues artists in particular often end in tragedy-- the underdog spirit of fighting to be counted remains as yet another reminder of our true "only in America" dream to go out and get things done. 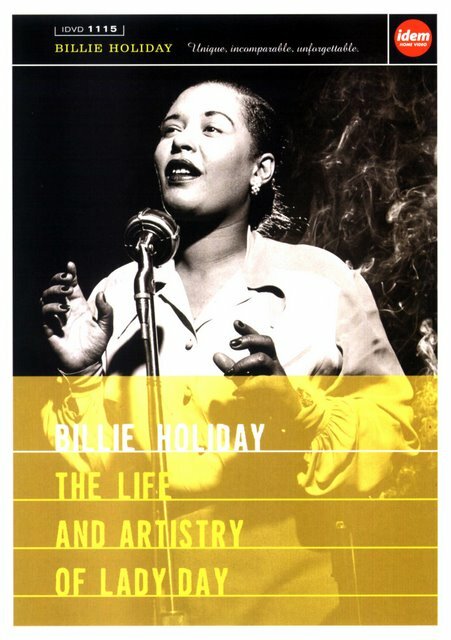 The life of Billie Holiday is no exception. Of course it ended in the most tragic of ways which we witnessed on the big screen in Lady Sings The Blues which reveled in the drugs and downward spiral instead of her accomplishments but honestly when you're presented with the facts that comprised the course of her life from birth onward, it seems as though that would be the inevitable conclusion. Yet at the same time, that doesn't necessarily take away from just how extraordinary her accomplishments were. For she was able to bounce back from the most unspeakable of horrors again and again and-- after viewing this heartbreaking yet inspiring thirty minute biographical portrait of the woman-- I think it's safe to say that most of the athletes in the aforementioned biographical portraits had it extremely easy by comparison. The granddaughter of a slave-- Billie Holiday was born to a nineteen year old mother and a jazz musician father who walked out on his responsibilities from the start as the first man to betray Holiday (yet certainly not the last). After the young Holiday was raped as a child-- as a female the crime was blamed on her and she was sentenced to a Catholic reform school until two years later when someone was finally able to free Billie. Afterward, with no money and no way to support herself as a black young woman with nothing to her name in the racially unkind jazz era, she worked as a prostitute to get by until eventually she moved into the music world. And soon enough she joined groups as "the girl" or the singer, making appearances on the albums of legends like Goodman before she starred in a short jazz movie chronicling jealousy and heartbreak-- the building blocks of the blues-- with Duke Ellington. Ironically ending up as part of the Fletcher Henderson orchestra in 1936 which had at one point been the one in which her father had been employed at the time of the pregnancy and birth of Holiday-- following her work with Henderson she forged an important alliance with Lester Young (who would bestow the nickname of "Lady Day" on Billie Holiday because of her elegance) and Count Basie. The epitome of the sad fact that sometimes during moments of great professional success, you're struggling with personal heartbreak and drama-- shortly thereafter Holiday suffered through some bad marriages including one to a man who introduced her to heroin and opium and then reinforced her reliance on it. Facing the double standard of being a black woman in the business and having to dress as a maid to costar with Louis Armstrong in a bit part in a Hollywood movie--after Billie's mother died, she soon after lost her cabaret performers license and ended up in jail for a drug charge which garnered her eight months behind bars while some of the male musicians roamed free, using and abusing with wilder abandon. Although her voice began to decline from drugs and personal stress and Holiday's next chapter of her life would be her most bitter one which came out in an autobiography-- perhaps the strongest way she wove her disappointment into art was with the recording of the song the DVD notes she "used as a weapon" with the release of "Strange Fruit" which had been written expressly for her and became a staple of her set list despite its unpopularity as an anti-racism song that confronted the race issue head on. While of course, her decline would continue until a tragic and far too young death which found her with police guard and under arrest while literally on her death bed (as though she were a dangerous threat)-- throughout the fairly succinct biography that also boasts some vintage, rare and/or unreleased performance footage and the Ellington short-- I couldn't help but admire the way she never gave into the setbacks that kept stacking up like dominoes until they just kept pushing into one another for the final crash. While of course she was born into the blues and stayed in the blues (by working in the field that had made her father the type of man who put family second and walked out on her as a baby), and ultimately she died in the blues-- the reason she sang the blues so well is because she lived them. But in doing so, she never let that stop her from trying to conquer the next obstacle in her path as a musical version of one of those Disney Titans we know we'll always Remember.